We've been planning to do Rayyan's akikah for a while now, and finally got it done last weekend on Merdeka holiday at my hometown, Penang. Felt obligatory to do so since my (elder) relatives are in Penang and Mom would probably give me a longg lecture on going back to my roots if we didn't. We didn't mind, though. It felt right. The day came, and guess what? 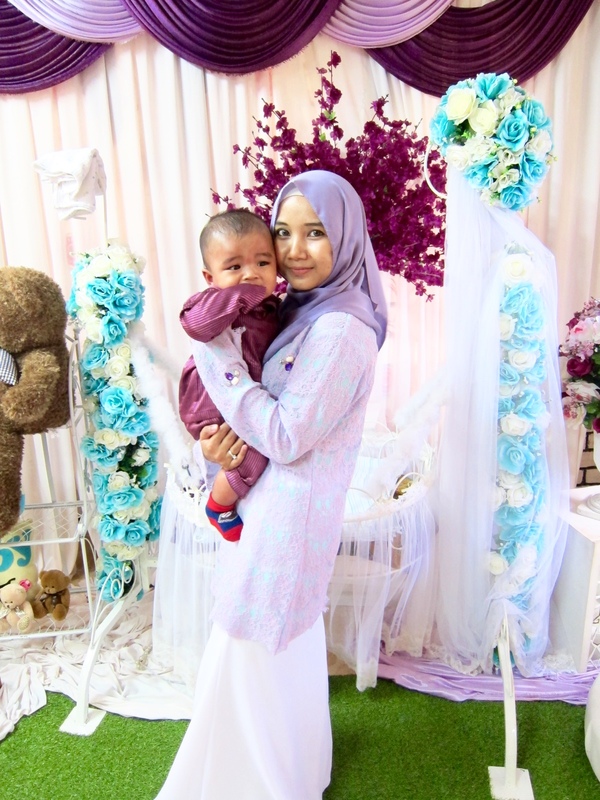 Rayyan's developed some weird red rashes all over his body T.T But surprisingly he was his jolly self, didn't throw tantrums albeit being slightly uncomfortable because of the rashes, and behaved all the way through the ceremony. 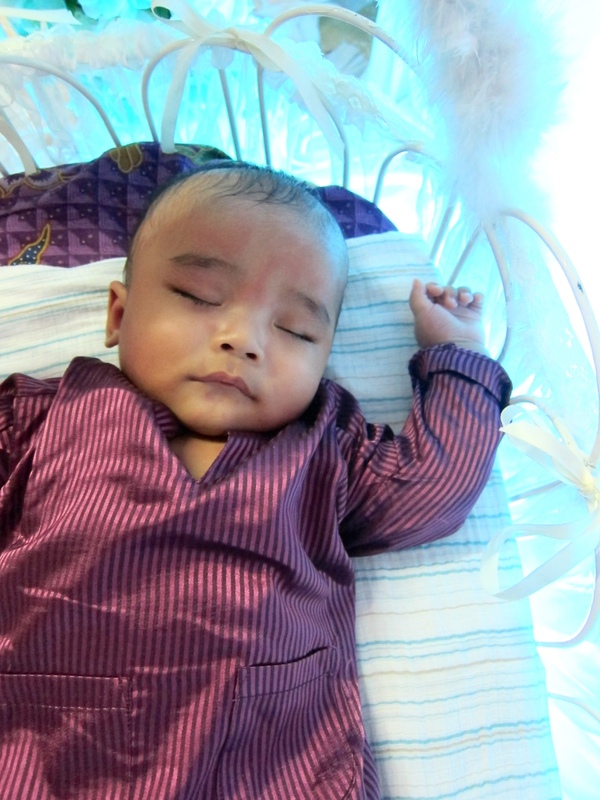 Even fell asleep after the elders sang the syair berendoi. I have a nice son. So this was how the day turned out. The elders started gathering at our house. I was still ironing our outfits, Shahrul was getting Rayyan ready in the room. Mom was shooting me death stares for not getting ready earlier lol. Yasin recital started. 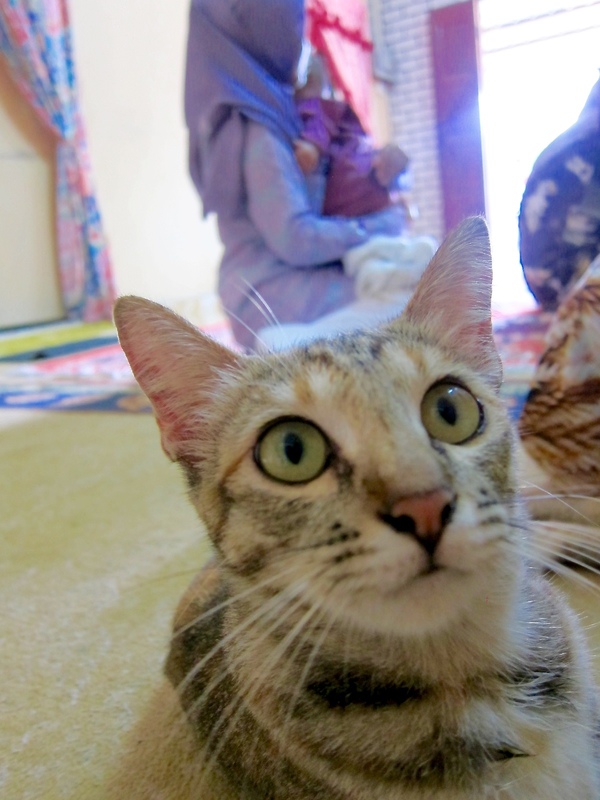 I held Rayyan, introduced him to some of the elders there, joined them reciting Yasin with Rayyan on my lap. "Oh this is the baby? How old is he? Oh dah besarrr"
Haha yeah they were surprised the "baby" has gotten so big lol. Yasin recital was finished and selawat started. 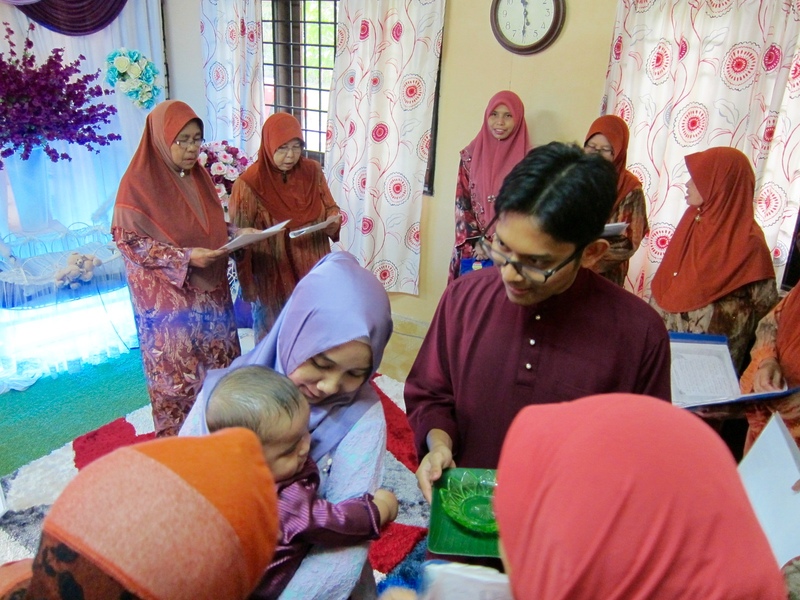 While they selawat, I held Rayyan through the elders' circle for the "belah mulut" ceremony, or tahnik. 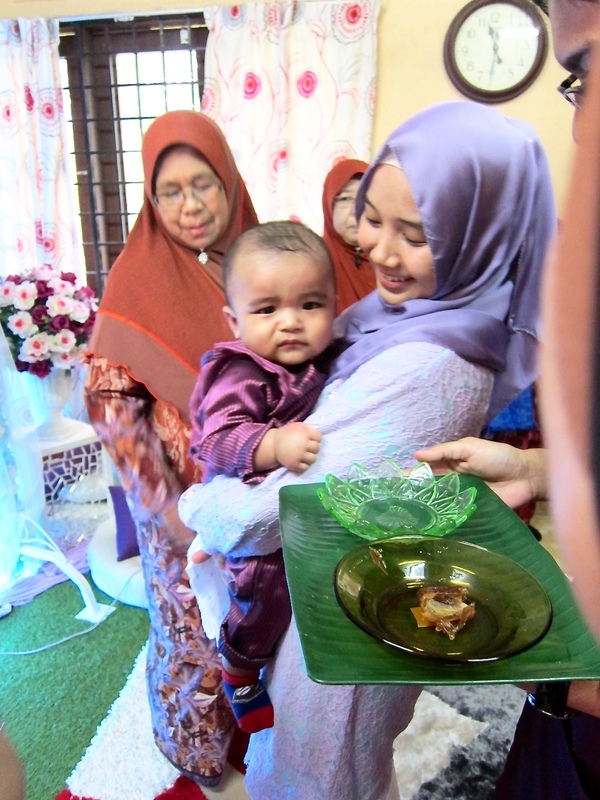 It's basically a traditional ceremony where the most respected elders would put some bits of kurma with air zam-zam into the baby's mouth as an indication of the start of his sense of taste. Still not sure about the medical benefit about it, though. The ceremony was nice, though. The syair berendoi starts. By this time, Rayyan was already so sleepy (and full from the kurma I think) so I just held him while the elders bersyair until he fell asleep. The syair lyrics was quite moving - it was in Malay, and consisted of meaningful phrases of mother's hardship going through labor to give birth, and the child's responsibility to uphold the family values and respect to the parents, especially the mother. My first time of hearing such tradition, but it was quite cool. The (real) festive starts. We had lambs for the meal of the day with some chicken mandy rice too, for those who don't eat lambs (like me). And some photo session with family and friends who came. 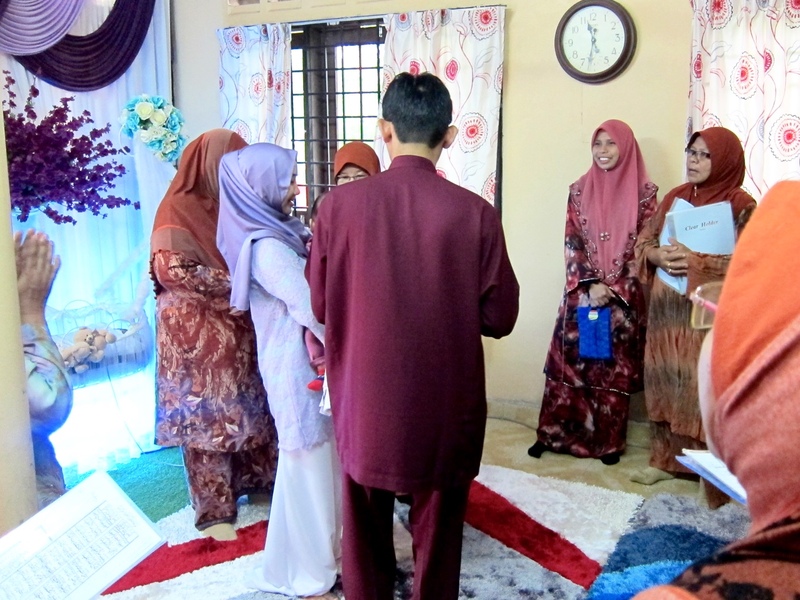 It was a private ceremony with just our families and close friends, but a beautiful one. 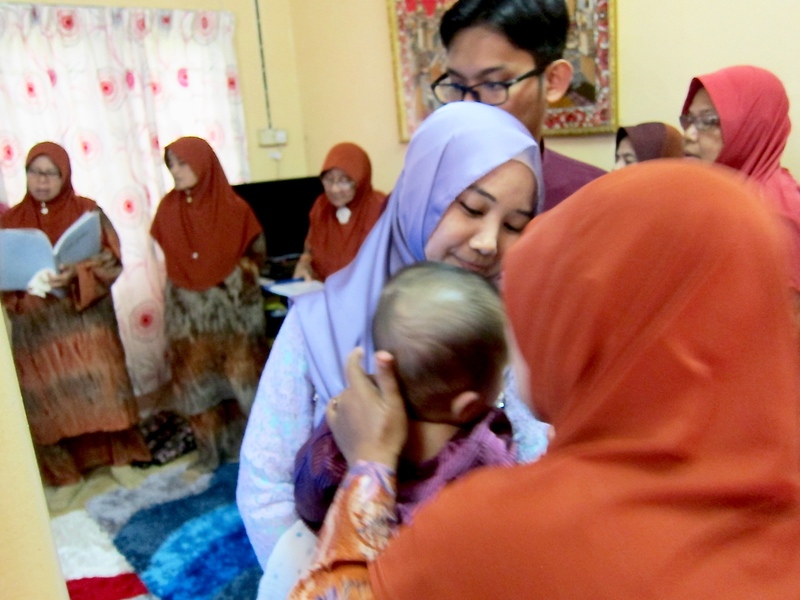 Seeing how Rayyan was celebrated by our family and the elders is something I will never forget. They selawat for him, they prayed for him, they fed him, patting him on his head or back - all the nice gestures from people he basically didn't even know. Really, really grateful for this little guy. ur baju zatil! so cantik! love your baju as well. ooohhhh can't get enough of rayyan. haish sangat comel la ini budak.